The Scriptures tell us that the Divine Name of Elohim is important! Isaiah 29:22-24 says, "Therefore thus said יהוה, who ransomed Abraham, concerning the house of Ya'aqob, Ya'aqob is no longer put to shame, no longer does his face grow pale. For when he sees his children, the work of My hands, in his midst, they shall set apart My Name, and set apart the Set-apart One of Ya'aqob, and fear the Elohim of Yisra'ĕl. And those who went astray in spirit shall come to understanding, and the grumblers accept instruction." The theme of being "set apart" or "sanctified" is doubled. Not only is Elohim's Name to be separated from the names of the world's gods, but there would be a "set apart" community that would follow both His Name and His Teachings. The Keil & Delitzsch Commentary interprets thus: "Just as Abraham was separated from the human race that was sunk in heathenism, to become the ancestor of a nation of Jehovah, so would a remnant be separated from the great mass of Israel that was sunk in apostasy from Jehovah; and this remnant would be the foundation of a holy community well pleasing to God." Accepting the "set apart" distinctive Divine Name is an emblematic marker of a person who is separated or "set apart" from the world and following the ways of Elohim. Are you part of that "remnant," that "holy community well pleasing to YHVH"? The Set-Apart Flock Will Know That "I AM YHVH"
Notice above that the setting apart of His Name is linked with our Spiritual cleansing from paganism, sin and idols. It is also linked to a new heart and walking in His ways. It is no accident that many of those who reject His Name also reject the continuing validity of His laws. It is no accident that many of those who reject His Name have debased grace into a license to sin. To own His Name is to model Him in your own life. We Answer Your Questions on the Divine Name! Sacred Name Expositors is a research ministry examining the Biblical Divine Hebrew Sacred Names. We treasure our Messiah and are eager to share our faith with you! We hope that you enjoy learning more about the Divine Names from the information presented on this website. Feel free to send us questions, comments or suggestions. Perhaps your question may help others as well, so do not be afraid to ask! We invite you to participate. Yah bless!! El is a title for "God", and Eli means "My God." It is not a nickname. These terms are very old. Yah or Jah is a short form for Yahu or Yahuah (capitalized as LORD or JEHOVAH in the KJV), and came later (see Exodus 6:3), as also did various combinations, such as "Elijah." I do not understand the importance you place upon knowing which combination came first, which may in fact be impossible to determine for certain. you should not be calling Our God yah, this is incorrect and a blasphemy. If it is blasphemy to use the name "Yah" then many Biblical kings and prophets must have been blasphemers in your opinion, because the theophoric Divine Name was used in their own names extensively, especially prior to the Babylonian captivity. For example, Isaiah's name in Hebrew was Ishiyahu, Jeremiah's name was Yeremiyahu, and so forth. See the articles on this website. The use of "Yah" in biblical names goes back at least to Moses' mother, known as "Jochebed" in our popular English Bibles, but Yahu-chabod (God/Yahu is my Glory) in Hebrew. Just because modern custom uses forms such as "Jesus", "God", "Lord," and the like does not make it either correct or original. Incidentally, the word, blasphemy", comes from Greek, not Hebrew, origin. The American Heritage Dictionary defines it as, "An irreverent or impious act, attitude, or utterance in regard to something considered inviolable or sacrosanct." It is not irreverent to refer to our Heavenly Father by the Name He gave us, nor is it an impious utterance. To the contrary, it is impious and irreverent to refer to Yahu(ah) by pagan or corrupt names! Sad to say, false traditions today are too often considered sacrosanct and inviolable. The Bible tells us the opposite! 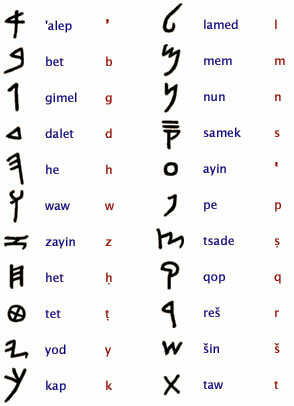 Andrew, yes here is the original Hebrew alphabet that was replaced by the rabbis in the second century, B.C., over a dispute with the Samaritans. Message: CJ Koster in his book "Come Out of Her My People" explains on page 1 of chapter 1 (figure 1) The Name of our heavenly in the Hebrew Scriptures is best transliterated as IaHUeH, according to the Oxford English Dictionary (see under Jehovah). And read from the Hebrew it would represent YAHU-EH or YAHU-WEH. Really enjoyed and learned much from your article "Better Covenant." I would like to have your thoughts re: CJ Koster's explanation.